If you are not aware of the benefits, why are you working on the project? How can you attempt to gain buy-in from stakeholders if you can’t explain how the project will help the business in language they can understand? I think project managers are (or should be) perfectly capable of understanding business strategy – and if you aren’t, you should get out there and learn how to understand it. So we weren’t off to a good start. Thiry does give clear definitions for projects, programs and portfolios. Programs, he says, are a way to realise business strategy. They are part of the make up of mature organisations and they ensure strategy and operations are more aligned. This is fine, but the book – not unexpectedly – doesn’t talk about how projects and project managers can cope when there isn’t a program to align with. This is a big gap in the current crop of project management books and it would have been good to see this book acknowledge that. There is a good (short) section on how to market your program, which talks about the evolution of project communication management to incorporate marketing skills. It’s important to ensure that you get the right stakeholder engagement, and pulling out all the stops when it comes to marketing is one way to do that. The book also includes a very clear job description for a program manager, so you can see how your communications and marketing efforts link in to the rest of the role. In other words, program culture is great, but the organisation might only support an individual or project way of doing things. It’s up to you to find a way to create a culture where the success of the program is more important than individual success (and believe me, this is difficult). Successful programs have good governance initiatives. Thiry spends a fair amount of time talking about governance. Governance on programs, he says, is a subset of corporate governance and is there to ensure that the purpose of the program is well-defined and achieved. He talks about three different ways of approaching program governance: controlling, integrated and networked, so there is likely to be one of these styles that fits your organisational and program culture. This section also looks at stakeholder management and how this differs from project management – not much, from what I gathered, although your stakeholder population on a program is likely to be much larger than on a project. This is a book in Gower’s Fundamentals of Project Management series, so it is pretty basic. As an introduction to program management it is solid, and there are some extra bits, like the concept of the benefits breakdown structure. The book also draws on frequent comparisons to the MSP and Program Management Professional (PgMP)® standards and sets the advice in the book in context with these. If you want to learn about program management, and you don’t mind the subtext that project managers have a one track mind and are limited in their skills, then this is a good introductory book. Program Management will be the prize for my November newsletter giveaway. Don’t get the newsletter? Sign up here to be in with a chance of winning when the time comes. 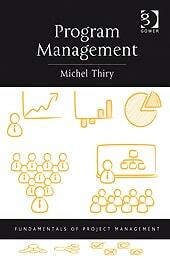 You can buy a copy of Program Management on Amazon. This book review first appeared on TalkingWork.com, during August 2012. Read more project management book reviews here.